The life cycle of a bee is about community. Every bee has a role and makes their community survive. 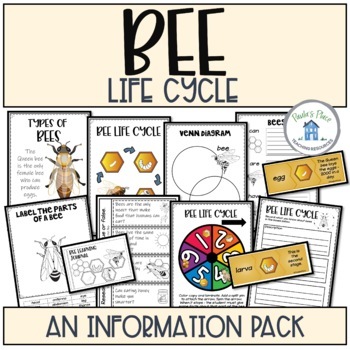 This pack will enable your students to understand each role and phase within the bee life cycle. This will be a record of learning as you move through the information about Bees. Put the book together first– instructions are included. Complete the first page before you start the unit. As you progress through the unit complete the pages in order. The students may go back and add information as they learn new things. 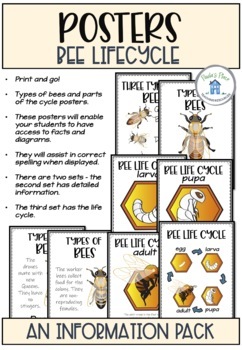 • These posters will enable your students to have access to facts and diagrams. • They will assist in correct spelling when displayed. • This will give you two books – copy and staple together and then cut in half. 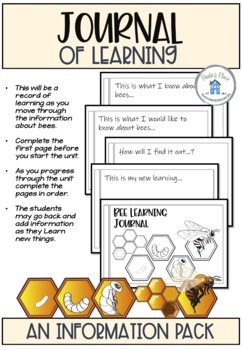 The following pages will consolidate and extend knowledge for all students about bees. Please make choices about which task are suitable for each student in your grade. • What do Bees eat? • Spinner - Color copy and laminate. Add a split pin to attach the arrow. Spin the arrow. 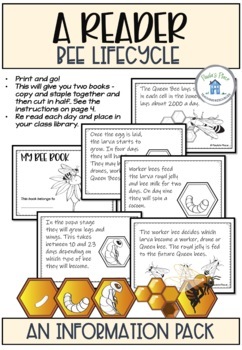 When it stops – the student must orally give some facts about that part of the Bee cycle.